Fathers' Day is just around the corner on Sunday 1 September so we thought we would run a competition for all the children who come into the store. Does your dad or grandad tell jokes to you that are supposed to be funny? 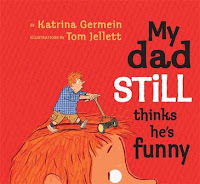 Tell us the one you think is his best joke and you can go into the draw to win a book package. To win, just print the entry form by clicking the link below, fill it in and drop it back to the store by 5 pm on Thursday 29th August. We're going to put the ones we receive in the store's window as part of our window display the last week before Fathers' Day so walk past and check them out.